All of our animal removal services are eco-friendly, economically sound & humane; making sure that no undue stress or injury comes to any Skunk, Squirrel or Raccoon babies. What are the first words that come to mind when you think of pest control? You may immediately come up with the names of particular pests such as termites, spiders, mice, or roaches. That makes sense since it’s what we do, but the first words we think of here are Customer Service and Customer Care. In other words, meeting your needs and providing complete satisfaction are our goals. You should not have to deal with the stress of a pest control problem. You have enough to do so let us deal with it for you. We use high-quality products and equipment to provide you with the best pest control options available. Does That Free Wildlife Removal Inspection Price Seems High? 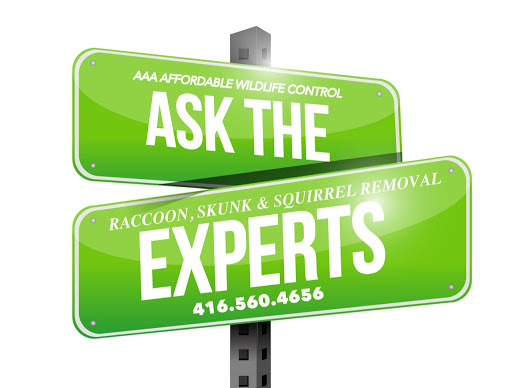 Some wildlife control companies in Toronto who claim the only way to solve your raccoon or squirrel problem is to spend extra (right now, on the spot) on prevention. Their already high service charge you were quoted on the phone (including unnecessary sprays they force you to buy or they won’t give you a guarantee ) is now double or more. They make you feel like the raccoon or squirrel will most defiantly get back into your attic if you don’t spend more money “right now!’. That FREE onsite inspection you thought was a good idea has now put you on the spot to spend more then what might actually be necessary to solve your wildlife problem. These high-pressure sales tactic are not used by AAA Affordable Wildlife Control, and we do not make our employees compete to see who can upsell the most at each house. When it’s necessary, we know how and where to install prevention screening on your roof. Yes, prevention screening will cost extra but, you can take some time (up to one week) to think about spending the extra money on the recommend prevention screening, without being charged another service fee later to install it as other wildlife companies would.